A collective of American Indian writers, filmmakers, visual and traditional artists, the 1491s’ distinctly indigenous brand of satire has drawn a sizable following, with a YouTube channel viewership of more than two million. In their own words: “The 1491s are a sketch comedy group based in the wooded ghettos of Minnesota and buffalo grass of Oklahoma. 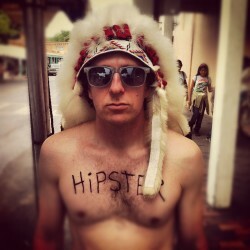 They are a gaggle of Indians chock full of cynicism and splashed with a good dose of indigenous satire. They coined the term “All My Relations,” and are still waiting on the royalties. They were at Custer’s Last Stand. They mooned Chris Columbus when he landed. They invented bubble gum. The 1491s teach young women to be strong. And teach young men how to seduce these strong women. Thanks to the Oklahoma Indigenous Studies Alliance for supporting The 1491s’ appearance.